As the gender-swapped spin-off of a remake, Ocean’s Eight (2018) feels convoluted merely based on its heritage. 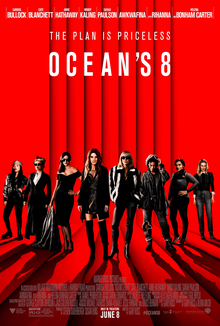 While I love the Ocean’s Eleven (2001) remake, I was curious to see what would make Ocean’s Eight something that would distinctly empower women (which I’m assuming was the point). In the end, it seems like Ocean’s Eight merely highlights the 72% wage disparity when compared to Ocean’s Eleven since most of the tropes and clichés almost felt like they were pandering to the very audience they were trying to lift up. While I will praise Ocean’s Eight for its ability to be a passable heist film, both with main and “twist” heists, that’s mostly where my adoration ends. Sure, I get the need to move the setting to New York to better align with fashion and other women’s interests, and part of Sandra Bullock’s character introduction after being released from prison was fun, but there were so many problems with the plot and characters that I’m still scratching my head days later thinking, “Wait, what?” I mean, there was no way that these women would have gotten away with this heist, especially considering all the details they had to overcome. They might have stolen jewelry, but they’d certainly be caught afterward. I suppose when it comes right down to it, the “Ocean’s” franchise doesn’t work outside of Las Vegas. That’s part of the appeal: the flashy razzle-dazzle of the casinos that entice us all to play games of chance to get rich quick. New York may be the city that never sleeps, but that’s because they’re working hard to earn their fortunes. This disconnect—along with the loose connection to the original reboot trilogy—is what disappointed me the most and made me want to go home and watch the 2001 Ocean’s Eleven. It also probably didn’t help that the music, while being great music, was more suited for The Man from U.N.C.L.E. (2015) than an Ocean’s movie. And yes, I’m aware this composer made the music for The Man from U.N.C.L.E. A sub-par “Ocean’s” movie on almost every level, I give Ocean’s Eight 2.5 stars out of 5.